Farley's Employee Publishes Debut Novel! Farley's Employee, William Hastings, has published his debut novel "The Howling Ages" with the Concord Free Press/ePress. Call the store 215-862-2452 for signed copies. 2014 marks the twentieth anniversary of the acclaimed French Laundry restaurant in the Napa Valley—“the most exciting place to eat in the United States” (The New York Times). The most transformative cookbook of the century celebrates this milestone by showcasing the genius of chef/proprietor Thomas Keller himself. Keller is a wizard, a purist, a man obsessed with getting it right. And this, his first cookbook, is every bit as satisfying as a French Laundry meal itself: a series of small, impeccable, highly refined, intensely focused courses. Most dazzling is how simple Keller's methods are: squeegeeing the moisture from the skin on fish so it sautées beautifully; poaching eggs in a deep pot of water for perfect shape; the initial steeping in the shell that makes cooking raw lobster out of the shell a cinch; using vinegar as a flavor enhancer; the repeated washing of bones for stock for the cleanest, clearest tastes. From innovative soup techniques, to the proper way to cook green vegetables, to secrets of great fish cookery, to the creation of breathtaking desserts; from beurre monté to foie gras au torchon, to a wild and thoroughly unexpected take on coffee and doughnuts, The French Laundry Cookbook captures, through recipes, essays, profiles, and extraordinary photography, one of America's great restaurants, its great chef, and the food that makes both unique. Susie Heller, executive producer of PBS’s Chef Story, has produced award-winning television cooking series and co-authored numerous award-winning books, among them The French Laundry Cookbook by Thomas Keller and Bouchon by Thomas Keller and Jeffrey Cerciello. She lives in Napa, California. 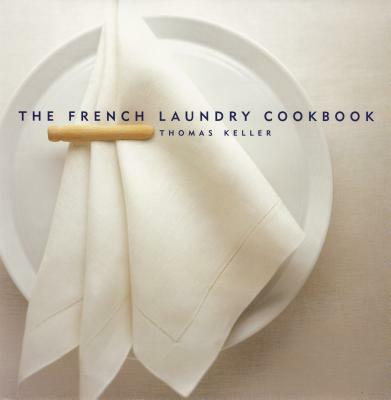 Thomas Keller, author of THE FRENCH LAUNDRY COOKBOOK, BOUCHON, UNDER PRESSURE, AD HOC AT HOME, and BOUCHON BAKERY, has six restaurants and five bakeries in the United States. He is the first and only American chef to have two Michelin Guide three-star-rated restaurants, the French Laundry and Per Se, both of which continue to rank among the best restaurants in America and the world. In 2011 he was designated a Chevalier of the French Legion of Honor, the first American male chef to be so honored. That same year, he launched Cup4Cup, the first gluten-free flour that replaces traditional all-purpose flour or whole wheat flour in any recipe, cup for cup, such that you’d never know the difference. As part of the ment’or BKB Foundation, established with chefs Jerome Bocuse and Daniel Boulud, Keller led Team USA to win silver at the 2015 Bocuse d’Or competition in Lyon, France, which was the first time the United States has ever placed on the podium. Deborah Jones's recent honors include Best Photography in a Cookbook from the James Beard Foundation for her work in Bouchon. A frequent contributor to national magazines, she conducts a parallel commercial career from her San Francisco studio. Situated on the main street of the historic Delaware Riverfront town of New Hope, Pennsylvania, Farley’s Bookshop and its knowledgeable, experienced staff have endeavored to satisfy the literary tastes of the area inhabitants for over fifty years. Whether you are Bucks County born-and-bred or just stopping by to enjoy the crisp river air and delightful scenery, you will be pleasantly surprised to find the largest and most diverse collection of books-in-print in Bucks County. Farley’s may have competition, but it has few peers. We encourage you to browse our website, but please remember that getting acquainted with our online persona is no substitute for exploring the narrow passageways and teeming shelves of our storefront and discovering that perfect book nestled amongst so many others.